Forums » YOUR CREATIONS & GUIDES » Tell a story everyone will remember. With the new Story App! A new App has been added to the App Zone! Get it directly from the App Zone or type /appzone 2134 ingame. A creative tool to build your own interactive stories and play stories made by others (with multiple paths and endings). I still remember an old roleplaying book, where I had to make decisions or roll a dice after each scenario and continue on a completely different book page depending on the outcome. Most of the paths were traps though, ah good old times! create your own stories or play stories other players made for you! addition of items, imagine you need a key to open a chest or a door to advance! If you have any ideas, suggestions or found something off please don't hesitate to contact me via izam mail or simply post in this thread and discuss it with everyone. This looks like a lot of fun, but there is no way to delete my story after i started it that I see, plus, how do you add the story line or different results? I am a bit confused. Is there a way to test it all out before it is published online for others to try? Thank you for your feedback, Naema! I changed the interface to use more well known icons such as edit, upload, download to help people recognize the features. You start by creating a new story and add chapters to it. Once the chapters are written, you can start linking them together to create a path through your story. Just edit a chapter again and add a path and the chapter to follow. You can test your story locally without uploading it, I also added the option to remove published stories again in case you made a mistake. 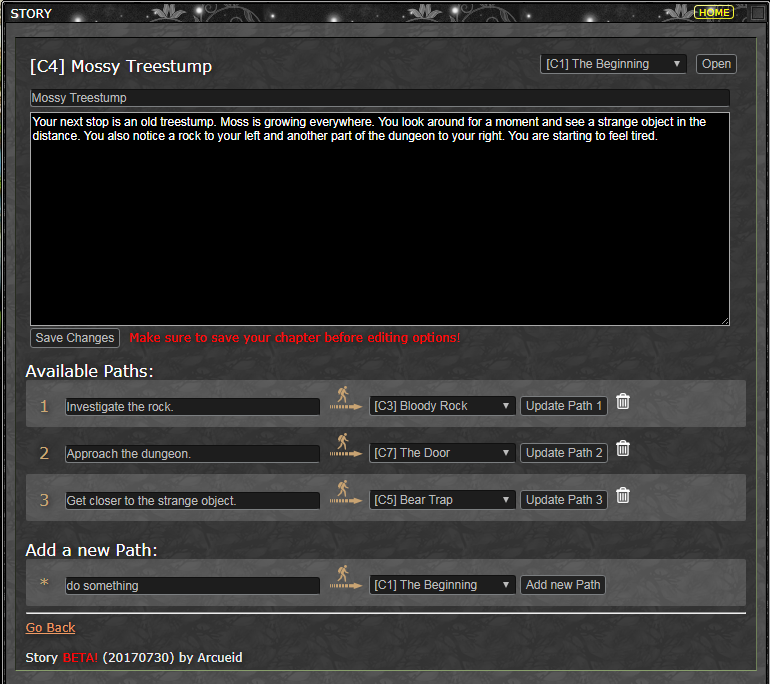 I'm going to add more hints and comments for the user and a tutorial as we speak! 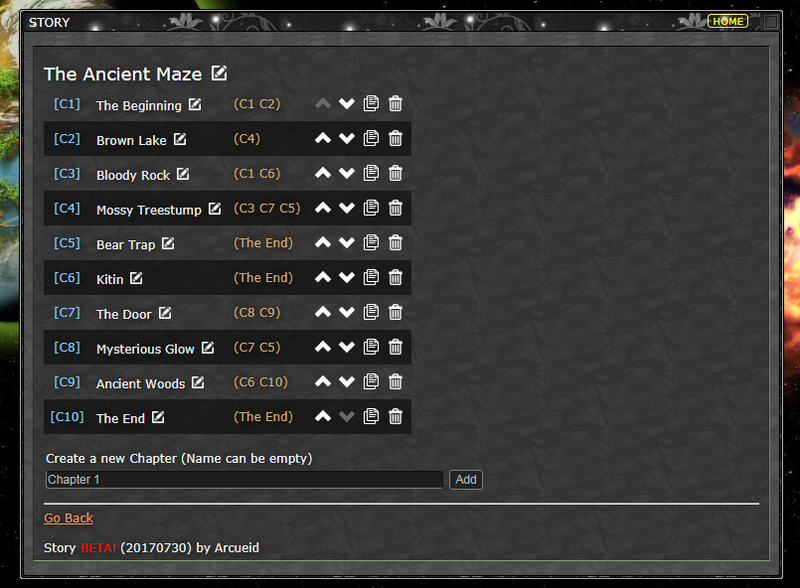 Added BB-Code to format your chapters, it is very similar to the forum. Example: [ b ] The Beginning... [ / b ] It was a cold night..
to make it look like this: The Beginning... It was a cold night.. I have a complex story planned, but I need to add items for it to work :) Stay tuned for more!